These Teriyaki Chicken Wings are going to be your new favorite way to make chicken wings. The Instant Pot makes them so quick while infusing the flavor into them like they’ve been slow cooked all day. Does the Instant Pot intimidate you? Have you bought one and it’s still just sitting on your counter? Trust me, it’s easier than you think, and this recipe is a great place to start if you’ve been reluctant to use it. Then, once you’ve made these you’re gonna want to try our Instant Pot Buffalo Chicken Dip. 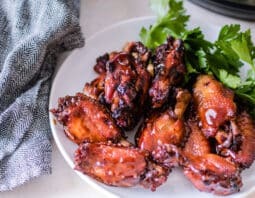 Instant Pot Teriyaki Chicken Wings are one of the easiest appetizers you can make. There’s no need to season your chicken wings prior to cooking. You’ll simply want to pat them dry with a paper towel then place them in the Instant Pot. Dump your favorite teriyaki sauce in and that’s it. I’m telling you…it’s easy! The trickiest part to the Instant Pot you’ll need to know and understand is the valve on top of the lid. It always needs to be set to sealing when the cooking process starts. Then when the time is done, you’ll let the pressure naturally release for 10 minutes. Some recipes call for a quick release which requires you to turn the valve to venting. Not for this recipe. Let the Instant Pot sit on the counter and naturally release pressure so your chicken retains its moisture and stays tender. Please note: this recipe has a 2-part process! First, you’ll cook the wings in the Instant Pot and then broil the wings in the oven to finish them off. 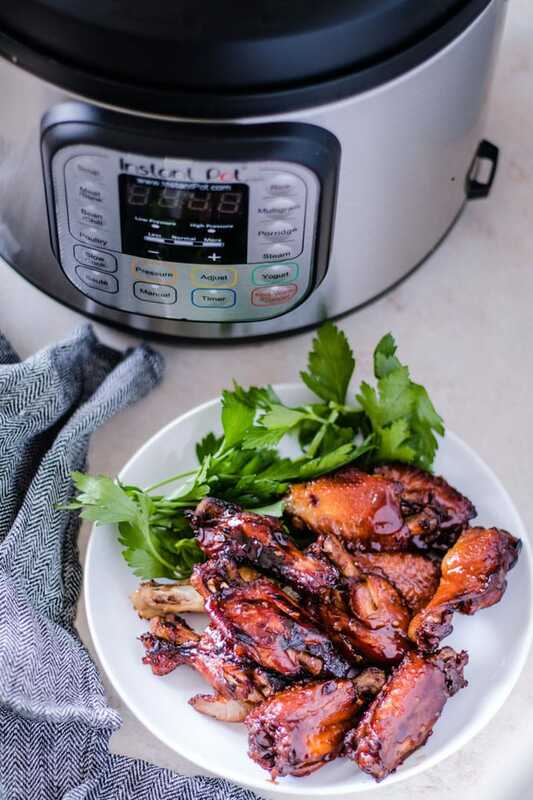 Add the wings to your Instant Pot. Pour the teriyaki sauce over the wings and add the garlic, pepper flakes and pepper to the pot. Place the lid on top and plug in the Instant Pot then turn the valve to sealed. Cook on high pressure (manual) for 5 minutes. When the time is up and the Instant Pot beeps, let the Instant Pot naturally release for 10 minutes. During that time, turn your oven on to broil and line a baking sheet with aluminum foil. Using tongs, place the wings on the baking sheet and cook for 5 minutes on one side, 5 minutes on the other. While wings are cooking, thicken the sauce. Turn the Instant Pot on sauté mode. Mix the corn starch in a small bowl with a splash of water. Whisk into the sauce in the Instant Pot until desired consistency. Garnish with parsley or green onion.